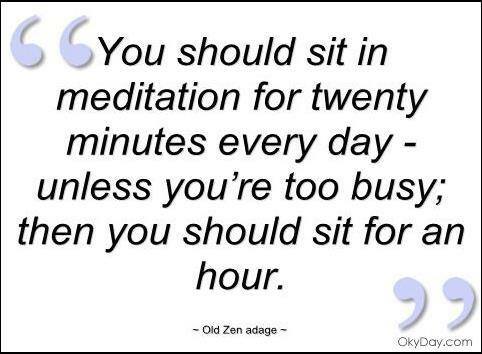 I found this “Old Zen Adage” online. I just have a few thoughts to share about it. First, Zen Monks spend all day, all year in meditation. A monk who spends one hour meditating is a slacker! It’s their job, what do they do during a coffee break…run laps or do laundry? Secondly, an hour? Really? I am lucky to steal 10 minutes of down time, let alone an hour. Taking time to meditate will only put me farther behind. Life is complicated. We wear several hats, have stacks of work, errands and obligations, and usually there are more questions than answers. How do we find balance? Slow down. Take a deep breath. Clear your mind and be still. Develop a one minute focused breathing or stretching routine to quiet your mind, relax your shoulders and renew your energy. You might find that taking a minute to calm the storm actually helps you approach your chaos with clarity and more energy.